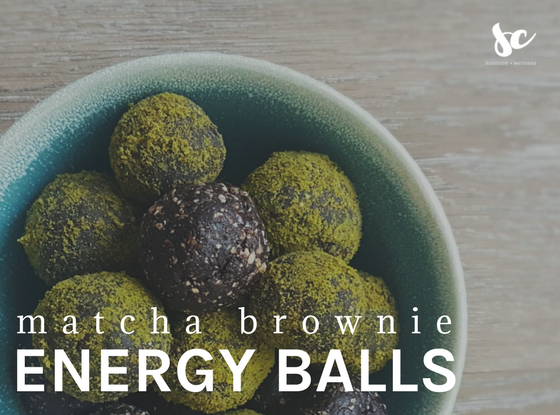 These Matcha Brownie Energy Balls take less than 15 minutes to make and are a life-saver when you're on the go! They only have a few ingredients and are d-e-licious. I strongly suggest making them in big batches and keep them in the fridge or freezer. You will want more. Place cashews and walnuts on a rimmed baking sheet and roast until they are lightly brown and fragrant (7 - 9 minutes). Remove from the oven and cool. Add nuts to a food processor and pulse until nuts are finely ground. Add cocoa and salt and pulse to combine. Pit dates and add one by one through the feed tube of the food processor while it's running (it is a bad idea to add them all at once, I promise). You should end up with a mixture that resemble cake crumbs but sticks together when pressed. If it is not sticking together enough, simply add more dates. Combine dough with vanilla and use hands to fully mix all ingredients. Shape the dough into bite-sized balls. Roll them in matcha latte powder and serve!